Ruth Puttermesser is a keenly intelligent woman and a fervent feminist, who by all rights should have been living an exceptionally amazing life. But despite her Ivy League law degree and total dedication, at age 34 she seems stuck with her lack of ambition in an ambiguous sounding New York City municipal department. But that doesn’t mean she’s boring. In fact, she’s anything but that, mostly because she’s been observing things – everything. So when work suddenly turns sour she takes things into her own hands. But are the upheavals and chaos that ensue her own doing, or not? 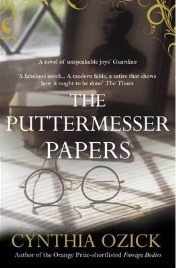 This is The Puttermesser Papers by Cynthia Ozick. If I was making a list of the most unusual books I’ve ever read, this would easily make the top ten if not the top five. What Ozick gives us here feels much like a set of short stories all based on this woman’s life, hence the “Papers” in the title. It starts with an introductory section that gives us an overview of Puttermesser and her life with a semi-outline of what is to come in the rest of the book. Ozick then includes four more sections, each one being a very different tale, which takes us chronologically from when she is aged 34, through to and after her death. Surprisingly enough, this is told in third-person omnipresent, and not first-person. This was obviously done so that the deity-like narrator could gain insight into all of the characters more objectively, including Puttermesser. What makes this story (or collection of stories) so fascinating, are all of the quirky things that Ozick adds here. We get Jewish folklore, where Puttermesser ends up conjuring up the first female Golem. Then we delve into literary history as Puttermesser becomes a quasi reincarnation of one of her favorite writers, George Elliot. Current affairs of the day come into play when Puttermesser’s cousin escapes the USSR and moves in with her. And finally, we probe Puttermesser’s most intimate fears and dreams with her death and afterlife. This last section cleverly connects with the first one that introduces us to this woman. All of this is done with an overall air of introspection and contemplation which touches on Puttermesser’s philosophy, faith and belief while remaining edgy because of her large doses of cynicism. If I had to find something that comes close to this, would say that this reminded me of a version of the Book of Job, but from the atypical prospective of the Coen brothers’ film “A Serious Man”. As you can see, when I said this was an unusual book, I mean this in the best of all possible ways. This is especially because Ozick is such an amazingly unique writer. Ozick captured me with the first paragraph, with a boldly clear voice that is thoughtful and intelligent and intriguing and harsh and even amusing. The first word that came to my mind to describe her style was “quicksilver”. By this I mean it is smooth and illusive and unpredictable all at the same time, but it is also enigmatic in that it is extremely solid and linear, while remaining fully fluid. By the way, my using these lists to describe the writing style is not accidental; it is my tribute to how Ozick writes, because she uses lots of lists (which are amazingly never annoying). With all this, it is somewhat of a surprise to me that this book, originally published in the US in 1997, only just now received its UK release. And yet, it might not be so surprising. Admittedly, this is an American-centric and New York-centric book, which might not appeal to a wide British audience. It is also a very Jewish-centric book, which would lend to both its gaining and losing interest on many different fronts. However, if this novel is looked upon as how I see it – a type of allegory, with a heavy helping of magical realism – it could, and should, draw a very large audience of admirers. In other words, as unusual as this book is, it epitomizes excellence in storytelling with rare style and exceptional intelligence. No, this book will certainly not be for everyone, and I can imagine that many will hate it completely and utterly. But I think The Puttermesser Papers by Cynthia Ozick deserves a full five out of five stars and would highly recommend it to anyone who is looking for something really distinctive to read. With thanks to the publisher for providing a review copy. One Comment on "The Puttermesser Papers"
Davida, to see this review is like a visit with an old dear friend. The Puttermesser Papers is one of my most admired reads. I adore it. It’s one of the reasons I haven’t been able to read the current novel winning lots of fans and praiseful attention, The Golem and the Jinni, because I figure I couldn’t help but compare Ozick’s golem to Wecker’s. (from what I’ve read of it -granted not the best yardstick to judge a novel- Wecker’s golem is a useful image while Ozick’s is pure golem squared. The novel as a whole is a brilliant concept brilliantly realized. So glad you’ve discovered Ozick. She’s utterly brilliant always. Might I suggest Heir to the Glimmering World next?